Buy through MusicWeb for £11.50/13.00 postage paid World-wide. 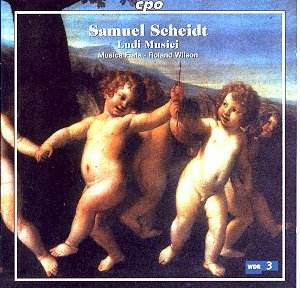 Samuel Scheidt was one of the great musical personalities in Protestant Germany in the first half of the 17th century. Most of his lifetime he spent in Halle, where he was also born. He started his musical career as an organist, and went to Amsterdam to study with Sweelinck. His influence is most noteworthy in the three volumes with keyboard music, published in 1624 under the title 'Tabulatura Nova'. In 1619 or 1620 he was appointed Kapellmeister at the court of Margrave Christian Wilhelm of Brandenburg as successor to the English-born William Brade, who was an important composer of instrumental music in Northern Germany. And Scheidt's instrumental pieces, published in four volumes under the title 'Ludi Musici' from 1621 to 1627, show his influence. Unfortunately the collection Ludi Musici hasn't been preserved completely. Volume 1 is complete, but volume 3 is lost. This disc mainly offers pieces from the second and fourth volumes, of which only some parts have been preserved. The missing parts have been reconstructed by Roland Wilson. In the booklet he explains how he has been able to do that. His efforts should be greatly appreciated as the music recorded here impressively shows Scheidt's brilliance in composing instrumental music. The most astonishing pieces are the paduans scored for four low instruments with basso continuo. It is interesting to quote Roland Wilson here: "The clefs of the LM II pavanes, recognizable from the surviving continuo part, are usually tenor, baritone, bass and sub-bass, which makes for extremely dense texture. If I had not had access to the complete manuscript version of the canzon for 4 low instruments I would not have dared to write such close harmonies. It is always apparent, not just in this respect, that Scheidt thinks as an organist; to him the four low instruments were simply a 16 foot stop in the organ and in practice the high harmonic content of historical instruments makes it possible. The use of four low instruments emphasizes the solemn, expressive character which is typical of all Scheidt's pavanes." This is reflected in pieces like the VII Paduana (track 2) played here with 2 viols, violone and contra-bass and the Paduan Dolorosa (track 10) played with four trombones. The Paduan à 4 (track 13) is also remarkable here played with four dulcians. They produce a gorgeous sound. The disc contains three pieces which have been found elsewhere and were probably originally part of the third volume. The 'Echo' (track 12), a canzona in two choirs, also appears as an organ transcription in the second part of the Tabulatura Nova. The last piece, the 7-part canzon on the hymn 'An Wasserflüssen Babylon' has been reconstructed on the basis of an organ version, reduced to 4 parts, attributed to Scheidt in the organ book of Daniel Schmidt, which - like the other two pieces - is preserved in the Staatsbibliothek Berlin. Although these pieces are formally dance music they are not meant to be danced to, but rather to be played at festive occasions and during dinner. And they are definitely not part of the popular culture: this is music written for use at court. The instrumentation suggested by Scheidt - mostly viole da gamba - also points in that direction. That doesn't mean other instruments are inappropriate: composers seldom specifically prescribed what instruments should be used. Musica Fiata uses a wide range of string and wind instruments, including trumpets, (muted) cornetts, trombones and dulcians, violins, viole da gamba, violone and contra-bass, with plucked and keyboard instruments for the basso continuo part. The programme is put together in such a way that there is as much variety as possible in character and scoring. Lively dances like courantes and galliards alternate with the more solemn pavanes. This is a delightful recording of some of the best instrumental music written in Germany in the first half of the 17th century. Musica Fiata gives wonderfully energetic and inspired performances. And the beautiful instruments used here have been recorded brilliantly by the recording engineer.